New Coventry City manager Mark Robins has made his first three signings for the struggling League One club. Midfielders Conor Henderson and Franck Moussa and left-back Jamie Reckord have all been signed in time for Robins' first home game in charge, against Carlisle United on Saturday. 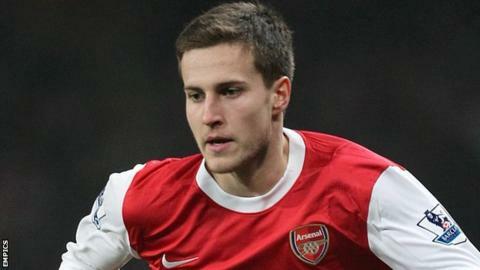 Arsenal's Henderson, 21, and Wolves' Reckord, 20, have both joined on three-month loan deals. Free agent Moussa, 23, signs a short-term deal after two years at Leicester. Moussa began his career with Belgian giants Anderlecht before joining Southend United, from whom he joined Leicester in August 2010. Republic of Ireland youth international Henderson made his Arsenal debut in an FA Cup tie in 2011 before suffering a knee injury that kept him out for most of last season. Reckord, who has been out on loan at Northampton Town and Scunthorpe United in the past two seasons, represented England at Under-16 and Under-17 level. "It was always in my mind to do three or four deals to bring in players to give us some added strength," said Robins. "Franck can play central or right-sided. He's got enough pace, he's tricky and can score so he gives us utility across the midfield. "Jamie Reckord is desperate to play so we're giving him the opportunity to force his way into the first team and he also provides good cover for the left-back spot. "In Conor, we have a very clever midfield player with a wand of a left foot in the mould of players like Michael Carrick and Chris Brunt who is desperate to play and hungry for it."